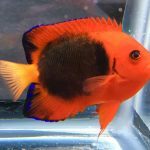 The smallest members of the angelfish family belong to a distinctive group named Xiphypops, which includes such common aquarium species as the Cherub, Flameback and Fisher’s Angelfishes. 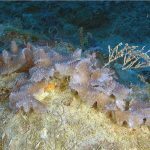 This group is noteworthy for its circumtropical distribution—these being the only dwarf species found in the Atlantic—as well as for the minimal genetic differences that separate geographically distant populations. In fact, if not for the very obvious differences in coloration between these regional populations, we would be hard-pressed to say that there wasn’t just a single widespread species. With the recent study of Gaither et al 2014, it was shown that the numerous dwarf angelfishes traditionally classified in the genus Centropyge are in fact a mixed group of superficially similar but distantly related lineages. 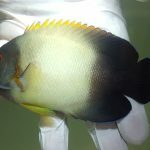 Angelfish classification hasn’t quite caught up to these genetic findings, but it can be assumed that at some point several new genera will be recognized for these distinctive clades, one of which is likely to be Xiphypops. The defining morphological features of the half-dozen or so members of this group have been recognized for a while, with Xiphypops first having been described in a publication from 1922 on Hawaiian fishes. 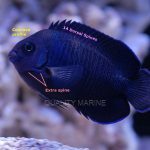 The most recognizable feature is the spined preorbital, which gives this group its scientific name, derived from the Greek xiphos (“sword”) and opsis (“face”). Other noteworthy traits are the small maximum size, the elongated body, the downturned mouth, and certain meristic differences in fin spine and gill raker counts. 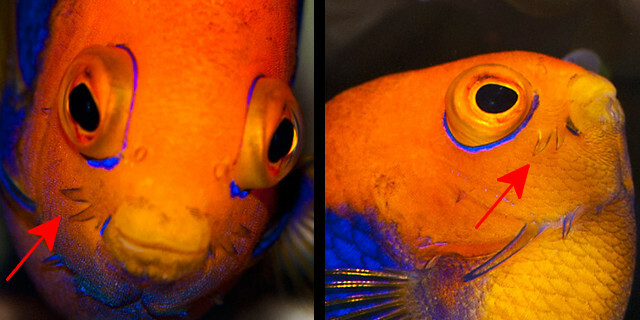 Aside from those details, the bulk of this group can be instantly recognized for the blue and orange color patterns these fishes usually share. Each major ecoregion typically has its own unique variation, which have usually been treated as separate species. However, for reasons that are not well-understood, there is relatively little in the way of genetic differences separating these forms, confusing our efforts to accurately classify them. Taken to its extreme, some authors have even gone so far as to treat the entire population of the Indo-Pacific as a single heterogenous “species”. More recent studies analyzing entire mitochondrial genomes have provided some argument against this taxonomic lumping, showing, for instance, a 0.8% difference between specimens from Kenya and the Philippines. 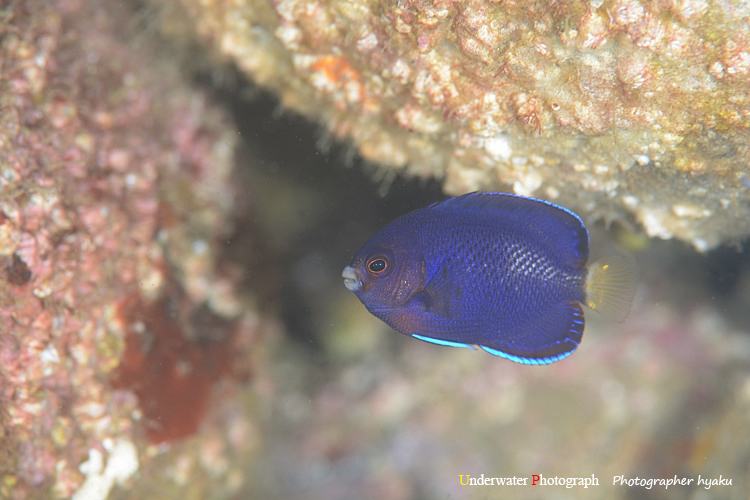 The greatest challenge to our understanding of these angelfishes relates to the populations present in the Indo-Pacific, which show a confusingly variable coloration that has led to many contradictory classification schemes. 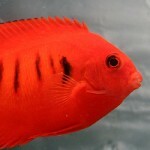 The most phenotypically distinctive is the African Flameback Angelfish (X. acanthops), from Eastern Africa, Madagascar, the Seychelles and the Mascarenes. 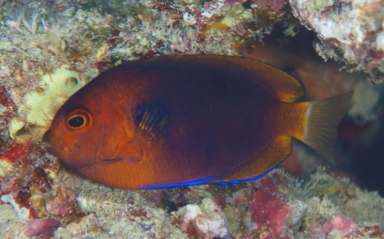 It gets replaced further east by the Whitetail Angelfish (X. flavicauda). 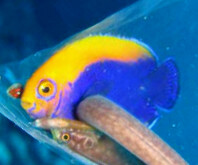 This fish is most often a deep blue throughout, save for its namesake white caudal fin; however, specimens from the Maldives often show a muddy version of the “flameback” patterning. 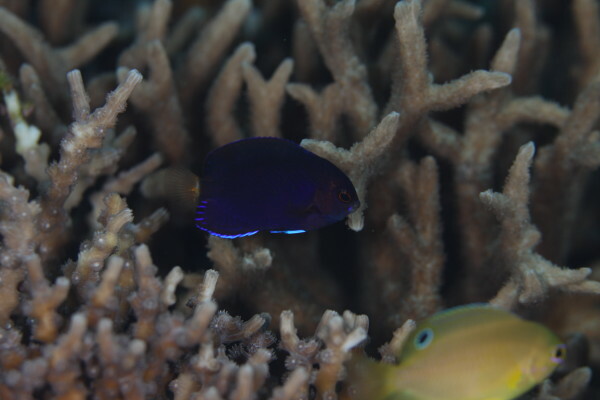 Such individuals have at times been suggested to represent hybrids, but, given that African X Maldivian hybrids of other coral reef fishes are rarely, if ever, documented, this unusual coloration is likely just indicative of normal variation for the Indian Ocean population. Whether or not there is any significant difference between this Indian Ocean fish and those found in the Western and Central Pacific is similarly unknown but seems entirely plausible. Uploaded by 王俊閔 on 2013-05-14. 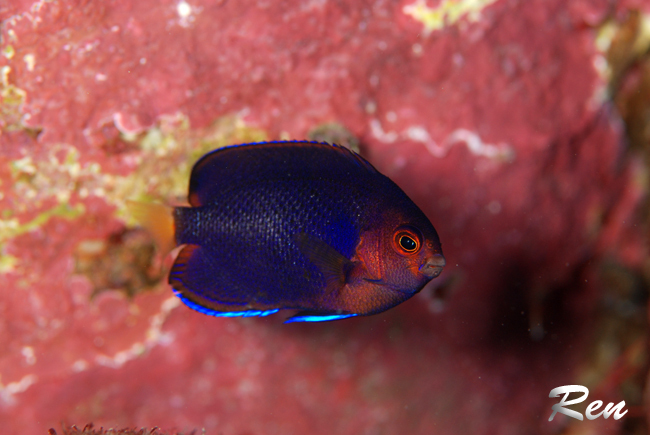 And, lastly, there is the Hawaiian endemic Fisher’s Angelfish (X. fisheri), named after early 20th-century zoologist Walter K. Fisher. This is perhaps the most variable species in this group, with specimens ranging from almost solidly orange to those that are nearly indistinguishable to the flavicauda phenotype. Because of this plasticity in appearance, most recent authors have tended to synonymize the Indo-Pacific forms under this name, but more detailed genetic study is needed here. The bright orange specimens that are common in Hawaii are rarely (if ever) seen anywhere else in the Pacific, which would seem to imply that this population is distinct. Moving into the Atlantic, we find three additional taxa. The Cherub Angelfish (X. argi) is a familiar fish to aquarists, collected heavily from Florida’s reefs but with a wide distribution throughout the Antilles.. It’s yellow face is the only trait that serves to distinguish it from its southerly neighbor, the Brazilian Flameback Angelfish (X. aurantonotus), which occurs along the northern coastline of South America south to the reefs of Brazil. 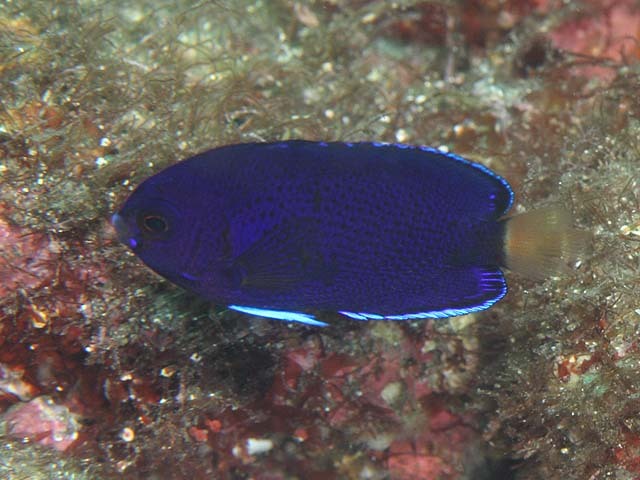 It has much in common with its East African relative, differing most notably in the coloration of the caudal fin. 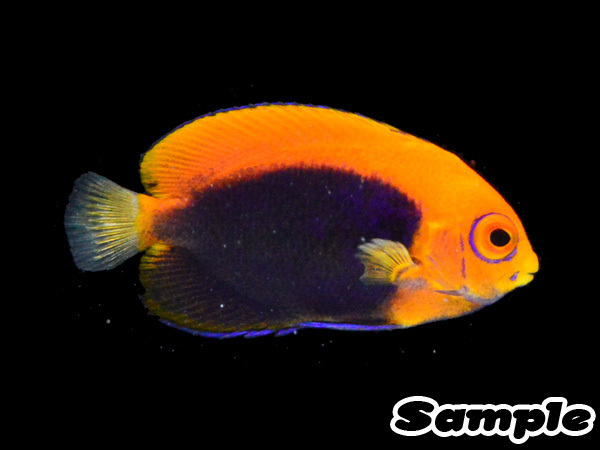 And then there is the holy grail of this group, the Resplendent Angelfish (X. resplendens), known only from Ascension Island in the Central Atlantic Ocean. 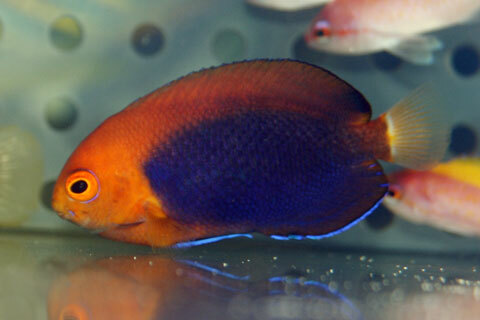 Captive-bred hybrids of this fish have appeared in the past, but, with aquarium collection no longer taking place within its range, purebred specimens of this stately fish are now impossible to come by. One noteworthy discovery has been the recent collection of what appears to be X. aurantonotus from the reefs of São Tomé in West Africa. Reports mention numerous individuals having been observed here, though whether there is truly a breeding population present remains to be confirmed. 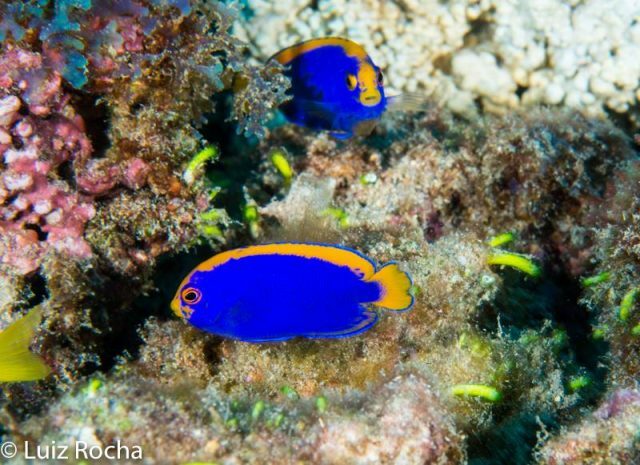 How this fish arrived upon these isolated reefs remains unknown—is this a recent colonization from the Brazilian population, or might this instead be a cryptic species endemic to Africa that shares an identical phenotype? 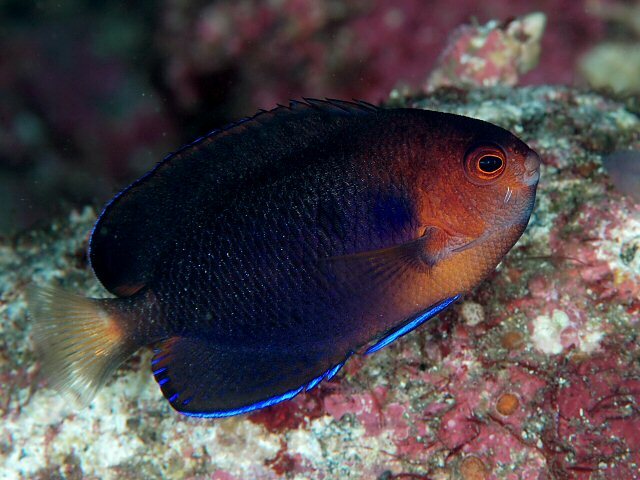 The only other species purported to belong to Xiphypops is the enigmatic Blackspot Angelfish (X. nigriocellus), a reclusive denizen of coral reef caves and crevices throughout the West Pacific. Captive specimens of this fish are rarely happened upon, despite its broad occurrence in areas heavily collected for the aquarium trade. Obviously, this species likes to hide, and it often can only be extricated from its rocky abode with the use of anesthetizing drugs. There are numerous morphological similarities that argue for this being the sister group to the circumtropical angelfishes we just discussed, but genetic confirmation for this is yet lacking. Obviously, there are significant differences in their color patterns and ecology, likely hinting at a fairly deep evolutionary split for these two lineages. One of the most interesting questions remaining to be answered about this group is just how it was that they managed to colonize the Atlantic Ocean when so many other dwarf angelfishes failed to do so. Genetic study has indicated that these oceanic populations split around 2.5MYA, which means that their only mode of entry would have been around the southern tip of Africa during a period when warmer currents flowed through this area. It’s rather remarkable that the only group that managed this feat should be these lilliputian pomacanthids. Is there some nuance of their developmental biology or ecological preferences which has enabled Xiphypops, to the exclusion of all others, to make this epic voyage? Sadly, by the time these intrepid angelfishes arrived upon the Caribbean, the Isthmus of Panama had already closed, preventing them from reaching the isolated reefs of the Eastern Pacific to speciate further. One can only wonder what might have happened had they managed to reach endemic hotspots such as the Clipperton and Revillagigedo Islands, both renowned for their spectacular Holacanthus angels.